My outdoor experiences include trips varying in length from one-day hikes to two-week trips. Most involve my three children. While my style isn't as 'high adventure' as some, I do enjoy the time we spend outdoors. My load used to be HEAVY - think pack mule. Reducing my pack weight may be the easiest way to lose weight. I have been challenged to hike a section of the Appalachian Trail this summer, and need to get both my pack and myself in better shape. While outdoors, I spend time hiking, geocaching, snowshoeing, cross-country skiing and camping. 10.6" x 18.5" x 9"
11.8" x 1.6" x 4.7"
11.8" x 20" x 0.4"
59" x 20" x 1"
*note regarding my measurements: All measurements were taken with products packed into their stuff sacks as tightly as possible. * Joint System: allows 2 or more pads to be joined without allowing any gaps. * Tube Construction: eliminates the side seams commonly found on other sleeping systems, which consequently reduces the overall weight of the sleeping pad. The MontBell U.L. 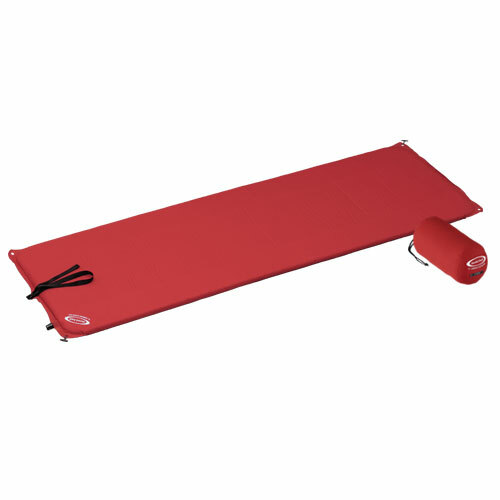 Comfort System consists of a long pad, short extension pad, and an inflatable pillow. The pieces are held in place by MontBell's Quick Connect Joint System that allows the user to hook 2 or more pieces together. This flexibility will allow me to leave the extension at home when I am using my hammock, or want to conserve space in my pack. The pieces connect to each other using sets of plastic toggles and preformed holes. Each of these are placed at opposite sides (diagonally). The pad self inflates by opening the valve, and and can be 'topped off' by blowing a couple of breathes into it. The pillow must be inflated by blowing it up. The pillow arrived rolled up inside of a very small stuff sack. Once removed and unrolled, I was able to inflate it fairly quickly with no more than ten breaths. At first, I inflated it completely, but found when I put my head on it, it seemed too hard. I let out a little air by slightly opening the valve and found the pillow to be much more comfortable. I am hoping that by being able to attach the pillow to the pad, it will not slide around during the night. I am not one to sleep in one spot all night, and usually lose my pillow at some point. The fabric feels slippery, but I do wonder if it will cause my face and/or neck, where it is in contact with my skin, to perspire while I sleep. The pillow should not be used as a seat, according to MontBell's web page. The inflated pillow is what I pictured from the web page information. I was very surprised at the small stuffed size of the pillow. The pad extender allows the user to increase the length of the pad, while only increasing the carry weight by a few ounces. The extender easily attached to the sleeping pad. I did try lying on it to see what happened if I moved around, as I do in my sleep, or when I am trying to get comfortable. I found that the pads stayed together, with out sliding around or becoming unhooked. The extender pad has three seams that run the width of the pad, allowing it to be folded easily. It is held together with a 1" (2.5 cm) wide elastric strap. I plan on using the extender pad on most occasions, except maybe when I am using the hammock. I will have to see how all the pieces fit together. The sleeping pad is the UL Comfort System Pad 150. It is considered a self-inflating pad, that also allows for inflating by breathing into the plastic filler valve. Once removed from the packaging I opened the air valve, unrolled it and set it aside for about 15 minutes. The pad was slow to inflate, even though it is advertised as self-inflating. I was surprised that when pinched, the pad felt like it contained a filling like a dense foam. I could not imagine how it would inflate. After 15 minutes, I gave the pad a few breaths and it immediately inflated. It did seem to inflate in sections. There appear to be three sections running the length of the pad. Once inflated, it no longer had that dense foam feel, and was more rigid, but flexible. lightening the pad. It is instead designed using a tube construction method. There are connectors on each corner of the pad, and a narrow strap at one end that allows the use of the stuff sack as a pillow. The idea is to stuff clothes in the sack, and strap it down to keep it in place. The fabric is smooth to the touch. I did notice that it felt cool also, while having sat in a 65 F (18 C) house for a few days. 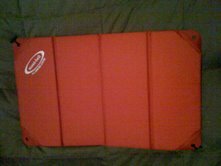 It makes me wonder if it will become cold to the touch while sleeping in cold temperatures, and then allow the sleeping bag to become colder where it is pressed against the pad. Loosening the plastic twist valve allows air to escape as the pad is rolled back up. Once rolled, it slides easily into its stuff sack. Included in the packaging, were two patch kits for the pads, in case of leaks. I am hoping that I don't have to try them out - but am glad they were supplied, just in case. While lightweight, the pads do not seem 'flimsy' or highly fragile. I am most concerned about the pillow, and will try to make sure that I pack it carefully, and away from anything sharp. The MontBell Sleep Comfort System arrived with no obvious flaws and so far all pieces hold air for at least 3 hours. The real test will be when I am sleeping on it for a whole night. I usually sleep better when outdoors, and find that if I don't, I have a hard time the next day being motivated, or having the energy I need. Over the course of the next four months, I will be watching for leaks or other structural issues. Beyond that, I am curious to see how well the pieces work together, what type of comfort they provide while I am sleeping, and if they noticably change how warm I stay at night. 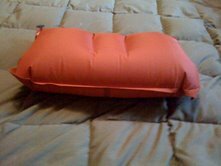 The pads will be used in different combinations with my MontBell Down Hugger #1 sleeping bag. I am curious as to how they will work in my hammock also. I'd like to be able to use the hammock earlier in the season, and would like to see what type of warmth the pads may add. Our night time temperatures are still in the 10-20 F (-6 to - 12 C) range, and lately it has been windy (a sign that spring is coming, slowly...). I should have plenty of opportunities to test the sleep system in cold temperatures. My thanks to MontBell and BackpackGearTest.org for the opportunity to test the UL Comfort System. Please stop back in two months (mid April) for my Field Report. Over the last two months, I have used the MontBell Sleep System on 8 nights. It has performed above and beyond what I expected. Read on for a breakdown of the conditions they were used under. Weekend #1 - Used in western Maine, two nights. Overnight temperatures hit a low of 12 F (-11 C). I slept extremely well, and stayed warm all night. The Extender pad and Sleeping pad were attached to each other, and stayed together all night, without the pads shifting around under me. I never found myself off of the pads, which would have been very uncomforatble, considering we set up the tent on cold, packed snow. The pillow is attachable to either the pad or extender, but I prefer to leave it loose. The pads kept the cold ground from making me cold and also provided a great cushion to sleep on. Midweek Trip - I spent three nights over our April vacation snowshoeing and camping out in New Hampshire. The three nights were spent in different spots, within the White Mountain National Forest. The night temperatures hit a low of 17 F (-8 C) on all three nights. The last night was very windy, and I found that it really made me thankful for the pads and pillow. The first two nights were fairly calm, and although cold, were comfortable. The last night was not only windy, but loud. The tree branches were creaking, and I could hear them snapping in the distance. Our tents were in an area safe from falling branches, but the noise made it hard to sleep. I was warm enough and spent most of the night reading. I was glad it was just a short hike out to the cars at daylight. One of the things I noticed on this trip, was that since the tent was shorter, the extender made the sleep system too long, so I decided to improvise, and put the extender under the area of my hips, and above. Oh, what a great idea that was! My hips tend to bother me occasionally after hiking, and then sleeping on hard ground. With the double padding, it was so very comfortable. Since it wasn't my tent, I didn't know that it was so much shorter and wouldn't hold me, my partner and our gear. I may not have brought the extender along had I known, but now would do it again, since the little bit of extra weight was well worth it. Weekend #2 - On a trip to central Vermont, I joined quite a few family members at an aunt's big, old house. The house used to be a hunting lodge, and so it sits on the edge of the woods. A cousin wanted to try winter camping but in a safe place. We headed out and hiked about 30 minutes into the woods, and up the side of the mountain, and set up the tent. Even though it was only about 6:30, we decided to stay there and play cards and talk. I ended up sitting on the extender pad, while playing cards, and then attached it to the regular pad before going to sleep. The Sleep pad worked very well once again, shielding me from the cold ground, and allowing for a good nights sleep. The top of the sleep pad was comfortable to the touch, which was amazing since the bottom was very cold, just like the tent floor. Weekend #3 - Spent the weekend along the Maine coast, hiking with a new MeetUp group. It was a blast - everyone hit it off very quickly. The temperatures were in the high twenties (-6 C)both nights, with moderate wind. It is always cooler along the coast, and usually much damper even when the humidity level isn't very high. I can report that the pads and pillow didn't 'feel' any different to the touch. After hiking 8 miles (13 k) along a somewhat rocky trail, enjoying great views and once again, gabbing with new hiking partners, I was really tired. After a great meal that we all contributed to (ever have a buffet while backpacking?) I was ready to sleep. I inflated the pillow in 4 or 5 breathes, 5 or 6 for the pad and I was ready to climb into my bag. I found out the next day, that a few of the guys stayed up for 2 more hours chatting and laughing, and I never heard a thing! I never even knew my tent mate came to bed, although he said I said 'good-night' to him. I woke up in the morning, and found that even though there was some condensation build up inside the tent, the pads were dry to the touch. The second night, everyone crashed early, after a day spent hiking and taking pictures and admiring some wonderful scenery. The wind had picked up a little, and although cooler, the air and ground felt drier. Again, no trouble sleeping, and I was warm enough, without any overheating on my part. The pads and pillow do a great job together keeping me comfortable whiles sleeping. I've tried using the extender at the top and bottom of the Sleep pad, and find no real difference. The pillow itself is easy to inflate and releases all the air when it is time to pack it back up. It is amazingly small when packed, and easy to stow away. There are no signs of leaks or defects. I was a bit surprised that it was just as inflated in the morning, as it was when I went to sleep. I did notice that if I sit on the pad, it compresses to the point of almost having no cushion in that spot, but when I lay down, my body weight is distributed enough that it isn't an issue. The 150 Pad Extender is a great part of this sleep system. It allows my whole body to fit on a mat, takes up minimal space in my pack, is extremely lightweight, and adds a lot of comfort. It shows no signs of wear or defect. An added plus is that it can double as a warm seat when stopping for a break. Unfortunately, I haven't had much opportunity to use the Sleep System much in the last two months. We've had an unbelievable number of rainy days since late May. I was able to use it for 3 nights over Memorial Day weekend, while hiking and camping in the White Mountains of New Hampshire. The temperatures were in the mid 40s F (4 C) at night, and the low 60s F (16 C) during the day. I believe those were the last three days without rain we've had in a row. I've used the pillow quite a bit. It packs so small and inflates so easily, it just makes sense to pack it. It makes sleeping so much easier and more comfortable. The pillow still holds air without deflating during the night. When its warm out, I put a t-shirt over the pillow so I don't perspire where the pillow and my skin make contact. The sleeping pad, and extender haven't seen any more use as I don't use a pad in the hammock. I was impressed with them when I used them. They provided extra insulation in cold weather and added to my comfort overall. The pad and extender work well together or separately, depending on how much length you need, and how much space you have. The pads pack fairly small and I feel are well worth the space that they take in my pack. The pads are well constructed and show no real signs of wear. The pad and pillow hold air all night long without needing to be refilled at all during the night. I'm looking forward to using them again this coming fall and winter. Thanks to MontBell and BackpackGearTest.org for the opportunity to test the MontBell Sleep System.